We recycle…more than just what fits in the blue bin! In this day and age, recycling has become very common, so having an office recycling bin is no big deal. But at our office, we have 4 recycling bins! One for general recyclables that go into our big recycling can outside and three for different types of paper that we recycle in our studio. The first is for shimmery paper. We save all the scraps from our paper flowers and use those to create new sparkly paper in our papermaking studio. The second is for plain paper scraps and off-cuts. We use these as base material when making new recycled paper. The third is for seed paper scraps! We save all these little precious scraps for making plantable confetti for wedding & event clients, for tiny punched out hearts for favor bags and whatever is left after that we plant in our own garden behind the studio. Did I mention we have a garden?? We partner with other local businesses to reduce waste! In addition to recycling as much as we can from our own studio, we also partner with other local businesses to help them recycle their waste materials. For instance, we take off-cuts from our letterpress printer, used office paper, junk mail and fliers from schools, offices and churches, imperfect flowers and greenery from florists, and fabric scraps from tailors—and we use them in our studio to make new papers. We also collect cardboard egg cartons & berry boxes from our friends and family and pulp those up as well. They make a great base for neutral toned paper. We are always on the lookout for new businesses to partner with. Got an idea of something we might be able to use? Contact us here! We run on SOLAR POWER! 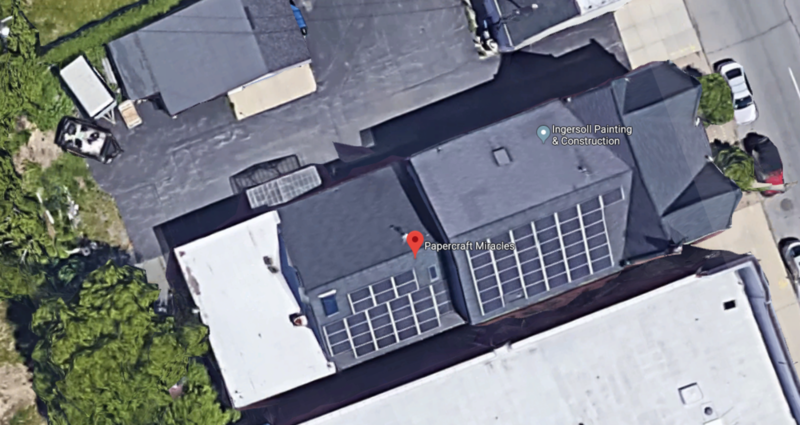 This arial view of our building shows our 64 3’x6’ solar panels mounted on our south-facing roof. With almost completely unobstructed views of the sun, we create about 90% of the power we use in this entire 8000 sq ft building…and only about 2000 sq ft of that is used for our business. This building also houses a women-owned construction company and a dance company and is also our home. During the summer, we easily create more energy than we use in the building and that overage helps offset the times during the winter when the panels have snow on them where we don’t produce quite as much. Overall, throughout the year, we are easily producing the bulk of the energy used at 1888 Niagara St.
We have solar-heated hot water too! The vertical panel on the top left side of the back roof is our solar hot water system. It uses a series of tubes to heat water using the sun and then cycles them into a large 80 gallon storage tank inside. This acts as a sort-of preheater for the water and then we have an on-demand hot water heater to bring the water up to the temperature we need it to be to use it. During the summer, the water from the roof gets very very hot and comes into the tank at over 115 degrees F! Even during the long Buffalo winters, the water coming in from the roof usually gets heated to at least 50 degrees which helps reduce the amount of energy needed to make paper, cook, take showers, do laundry, etc. 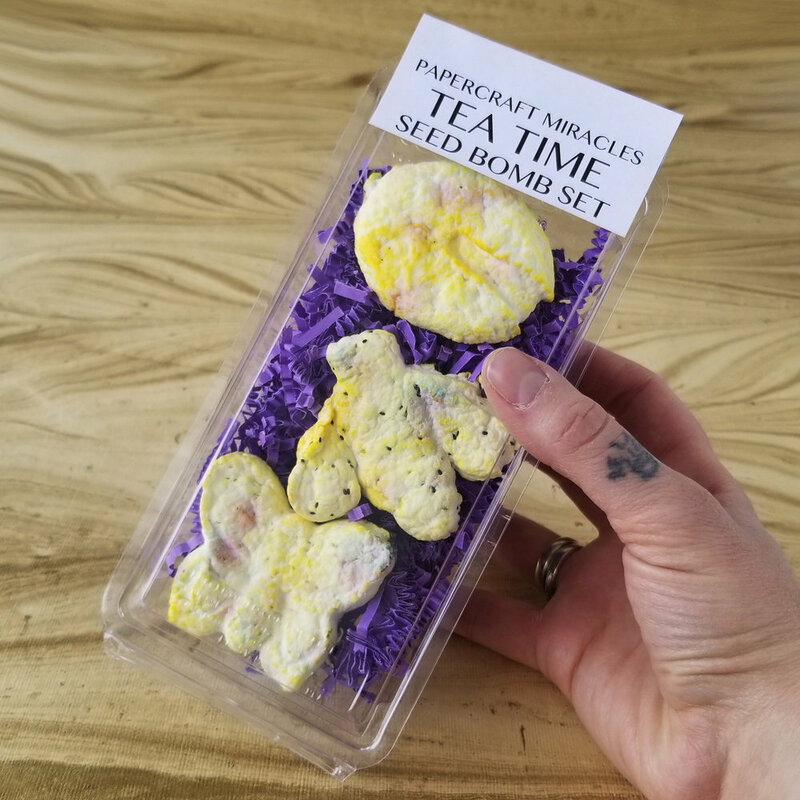 We manufacture plantable products with seeds right in them! 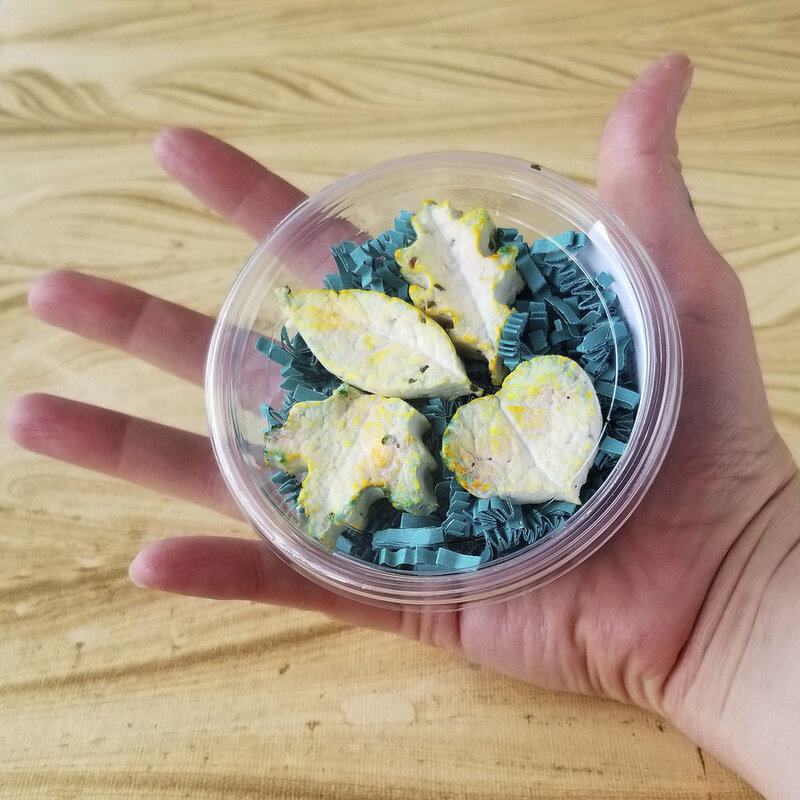 We have a variety of plantable paper products like our seed paper and seed bombs. 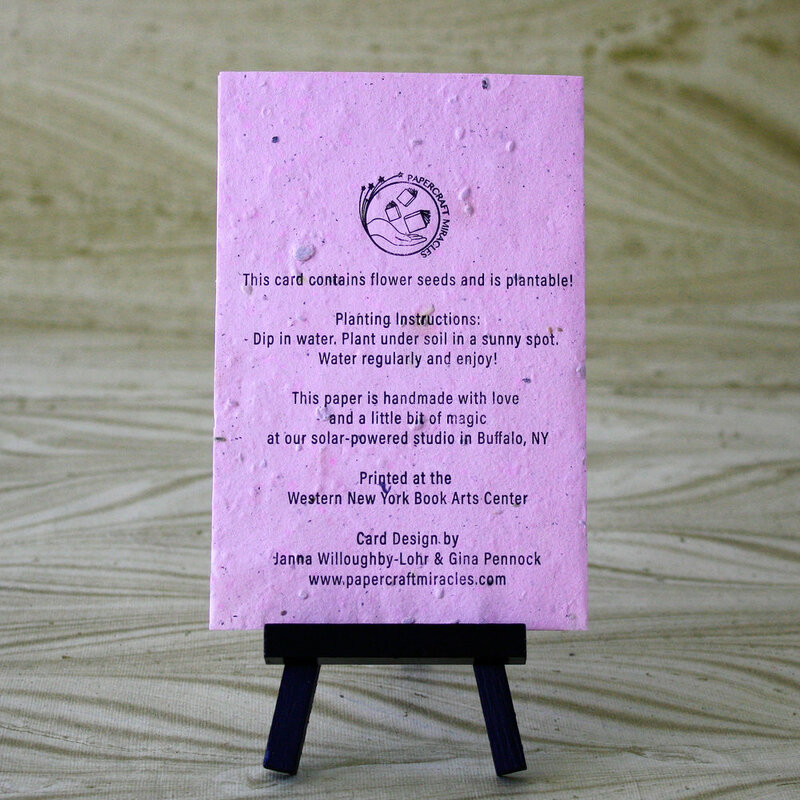 These products have seeds embedded right into the paper and will grow when planted in the ground. We can make these items using many different types of flower, vegetable or herb seeds. Our plantable products are also made using 100% recycled paper or fabric pulp (as are many of our other products as well). All of our packaging is compostable! We strive to be as eco-friendly as possible and, much as we’d like to, selling our products without any packaging just isn’t realistic. So we did the next best thing! We have made the effort to only use compostable clear celulose-based packaging for our products. This includes the cello bags that our cards and stationery sets come in, the flat-bottom bags that our single seed bombs are packaged in as well as the larger boxes and cups that our seed bomb sets come in.